Good solid camera body, good grip, pancake-style wide angle lens, easy to handle, easy to control. I like the Olympus PEN E-P3 camera. In the two past articles, we looked at digital camera systems by focusing on the lenses and the image sensors. Now, it all comes together with an article about digital camera bodies. As you know from the previous two articles, I am especially interested in a camera system that offers high quality images but does so with a small, lightweight package that I can carry with me everywhere I go. It must be easy to handle, and hold steady, while composing and taking a picture. It is exceedingly difficult to do this with just two points of contact. You need a triangle for stability. Or, you need a tripod (or monopod). At the very least, the body must include a sturdy hand grip. The various knobs, buttons and switches must be large enough to manipulate, and well-placed so they can be operated without looking at the labels. The most common operations should require no more than one touch. It must offer automatic exposure and automatic focus, each with a manual option. Ideally, the body should be stabilized by technology as well as my own hands. In the land of micro four thirds, APS-C and similar cameras, and on most point-and-shoot cameras, there is no built-in viewfinder. This is a problem for several reasons. First, the viewfinder completes the triangle that allows steady hand-held work. Second, the viewfinder blocks out light and distraction so you can concentrate on composition and exposure. Third, if the viewfinder is an accessory, it’s likely to be small, expensive, and easy to lose. Expensive: about $250 for a high-tech item that’s much smaller than a golf ball. Here's a look at the back of the E-P3. The left finger is pointing at a focal point. In one mode, this finger touch can trigger the shutter. Camera manufacturers love to market their cameras by emphasizing features. After using an E-P3 for several months, my initial thought has been confirmed time and again. Most of what the camera does, I don’t need. And, as it happens, what a micro four thirds camera does is somewhat less than what a DSLR does. Most of it is clutter, or, at least, image work that would be more effectively done not in the field, but with a portable or desktop computer whose screen allows a far more critical approach to changes in color temperature, or conversion to monochrome. I shoot RAW. That’s important. Shooting RAW images allows me to capture as much picture information as possible, and then, in the quiet of my home office, I edit the images, knowing that the original remains intact. RAW images require more storage space on SD cards than JPEGs require–so buy yourself an additional card (they are becoming inexpensive) or two. I should mention that RAW shooting requires special software, such as Apple’s Aperture or Adobe Bridge (comes with Photoshop). I use manual and automatic exposure, and I use manual and automatic focus. When I have the time, and the shooting situation allows, I will mess with f/stops and shutter speeds. Not every shooting situation allows, so I rely upon automatic. On the Olympus E-P3, I leave White Balance in automatic mode, and I do the same with Image Stabilization. Two fewer things to think about. I keep the Art Filters off (I can apply special effects later), and stick with either Natural or Vivid images. I shoot in 4:3 format, and may decide to crop later on. I keep the flash in the off position. I’m glad it’s built into the E-P3 (it’s not always part of micro four thirds cameras), but I don’t use it except in special situations because I use faster (larger aperture) lenses. The OLED screen on the E-P3 is a touch screen with just a few features that make use of this technology. One that I use often combines the selection of the image’s focal point with a shutter release. I just point at the spot where I want the image to be focused, and the EP-3 takes the picture. Cool! 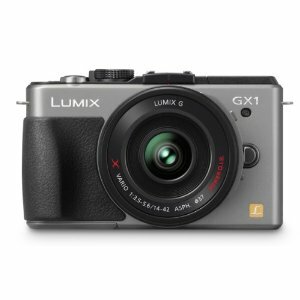 A handsome, modern body for Panasonic's very capable GX1 micro four thirds camera. At first, every new interface seems confusing. Use the camera every day for a few weeks, and everything becomes easier. I like the way that Panasonic’s GX-1 displays f/stops and shutter speeds. I like the layout of the Olympus E-P3’s physical buttons are laid out (but I wish each one contained a tiny LED so I could find it in the dark). I find the grid guides very useful on the Olympus as well–and I never turn them off. Every camera includes some outstanding button and menu features, and some that don’t matter a whole lot in the real world. When you’re in the store, you may be much affected by the confusing menu. Get past it. Instead, concentrate on whether the camera feels good in your hands, whether the technology is sufficient for your needs, and on the quality of the lenses that can be used with the body you have in mind. In this era of high-tech everything, it’s easy enough to overlook the obvious. Olympus, Panasonic and the others have packed an enormously sophisticated computer into a box half the size of a roast beef sandwich. The result is a camera system with tremendous flexibility and very impressive image quality. Although I’ve questioned the accessory viewfinder concept, the implementation is very impressive, moreso on the VF-2 with its 1.4 million dots (very high resolution, very bright screen), less so with the more utilitarian, and less costly, VF-3 (just under a million dots, and you’d be surprised by the difference). The VF-2 costs $249, and the VF-3 costs $179. These fit onto any of the recent Olympus PEN cameras (see below). Face detection amazes me. Scene Select makes it easy to, for example, shoot fireworks without messing around with optimum settings. Very convenient. Small stuff matters, too. An infrared beam allows accurate focusing under dim lighting conditions. It’s easy to shoot multiple exposures and to remain in focus while doing so. These cameras shoot movies (not uncommon in 2012, but still amazing to me, and detailed more fully in the next article). Here's a relative size comparison between a full-sized professional DSLR, a consumer DSLR, a micro four thirds camera with interchangeable lenses (but no mirror, so it's not an SLR, and so, it's a mirror less camera), and one of the best small compact cameras. In fact, there are about a hundred mirrorless cameras and camera bodies for sale at B&H. At $7,000 or more, Leica makes four full-frame mirrorless cameras; their lenses are exquisite, and, sadly, so are their prices. 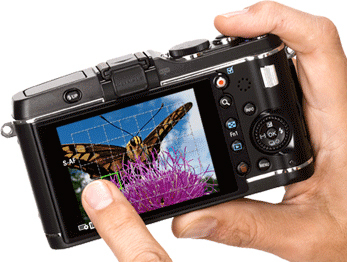 Fuji’s X-Pro 1 is a 16MP APS-C camera, coming in April, that costs $1,699 for the body. It’s a terrific camera, but somewhat heavy (some would say, professional in heft) in this smaller class. Sony’s NEX-7 is a 24 MP champ, but I find the lenses too large for the small body; buy the body with a kit lens for $1,349, or the 16 MP model, with fewer features, for half that price. The micro four thirds cameras also come in colors (sigh). 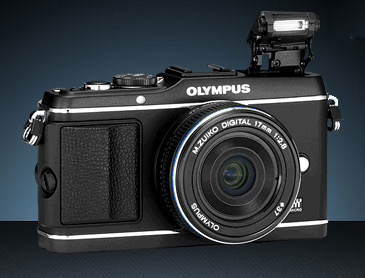 The starter model is Olympus’s $499 E-PM1, complete with kit lens, or Panasonic’s $399 GF3, body only. When I compare these two cameras on the very useful Snapsort website, the winner is the Olympus because it includes in-camera image stabilization, and other features associated with costlier models. When hold these two cameras in my hand, I find the controls on the Olympus a bit tiny and the lack of a grip off-putting, but in truth, the camera is small enough for use without one. The mid-price models ($699) are Panasonic’s G3 for including the kit lens and thankfully, a built-in viewfinder (though not as good as the better add-on versions), which competes with the Olympus E-PL3. Both offer tilt LED screens so you can use the camera by holding it over your head or at the level of a child or pet’s eyes. Serious photographers will likely spend a bit more money for either the Panasonic GX-1 ($799 with kit lens) or my current favorite, the Olympus E-P3 ($899 with kit lens). For me, it’s a close call, because both cameras are solidly built (more solidly, it seems, that their lower-priced kin), and because the cameras are intelligently designed, with every feature, and every button, in a reasonable, logical place. The Olympus feels better in my hands, but you may prefer the Panasonic for the same reason. I like the Olympus images a lot–the color is true, the sharpness and depth are present in every shot, and, well, the camera just makes sense to me. This market changes every year, and sometimes, more than once a year. A new Panasonic model GF5 is likely by summer. Olympus’s new E-M5, with a 16 MP sensor, image quality that competes successfully with the larger APC-S technology, and a built-in viewfinder is just around the corner. BH Photo is already selling it with delivery likely in late April, for $999 for the body alone, or $1,299 for the body with a new 12-50mm kit lens. And everybody is wondering whether Canon will enter the category with a powerful, small, interchangeable lens kit of its own. Oh, one more thing. Video. Now standard in many digital cameras, the video capabilities of mirrorless cameras are worth a look. The video article will be final one in this series.